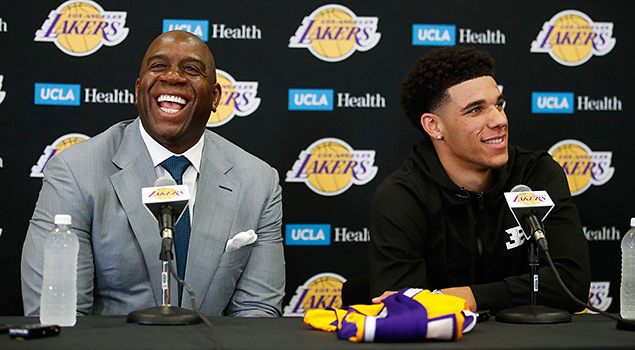 Magic Johnson admitted that 19-year-old Lonzo Ball needed to win him over during the NBA draft process. Even though Johnson and the rest of the Lakers brass had their eye on the former UCLA All-American guard they needed more validation. Their first meeting didn’t quite live up to Johnson’s expectations. The second meeting in Chino Hills, however, was a game-changer. After visiting with the Ball family in their Southern California home, the L.A. Lakers legend was finally convinced Lonzo can be the point guard to lift the Lakers out of their funk and challenge the heavily favored Golden State Warriors in the Western Conference. The Lakers are in the midst of the worst stretch in franchise history, posting an abysmal 91-237 record the last four seasons and landing in the top three of the draft lottery three straight years. Lakers Nation is so desperate for a winner it is willing to absorb all the blowouts and embarrassing losses the last four years just to land a superstar. A day after selecting Ball with the No. 2 pick in the draft, the Lakers held a press conference to introduce their newest headliner. Magic, who was named the Lakers’ president of basketball operations back in February, pointed to a wall inside the Lakers practice facility where all the retired Lakers jerseys hung. He told Ball he expects his jersey No. 2 to be hanging up there some day. Talk about putting pressure on a guy who is just two years removed from high school. Ball is facing sky-high expectations. He’ll play a huge part in Johnson’s grand plan to rebuild the Lakers brand and make them relevant again. Ball won a state title in high school and took UCLA to the Sweet 16 in his one-and-done season. He’s a winner, and the Lakers are hoping that winning touch and unselfish mentality can carry over to the pro level. It didn’t take long before Ball found out just how bright the spotlight can be as the new leader of the Lake Show. Ball struggled during his Lakers debut before a sold-out Thomas & Mack Center in the NBA summer league in Las Vegas. He went 2-for-15 from the field and 1-for-11 from 3-point range. His very outspoken dad, LaVar, called it the “worst game” of his son’s young career. Naturally, Ball was roasted on social media. The “haters” came out in droves. But Lonzo took all the criticism in stride and vowed to play better. And he did. In his second summer league game before another jam-packed crowd, Ball posted a triple-double. He scored 11 points, grabbed 11 rebounds, and dished out 11 assists against the Boston Celtics. He showed flashes of why he was college basketball’s best passer. There was a buzz in the arena with every shot, with every drive, with every no-look pass, and even with every miss. Lonzo played with pace and poise, two important skills that’ll come in handy when he’s running with the Laker regulars in three months. Magic wasn’t too concerned when Lonzo struggled in his pro debut. He understands that it’ll take time before Ball can get comfortable being the maestro of Showtime 2.0. And if there was any hint of an issue with Lonzo’s omnipresent, controversial father, Magic cleared that up real fast when he spoke to LaVar prior to the draft.